Next message: [Neutron] Call for papers: "Advances and Frontiers in Chemical Spectroscopy with Neutrons, 14-16th November, The Cosener's House Abingdon"
The construction of the new building at the LANSCE Weapons Neutron Research (WNR) facility is complete. 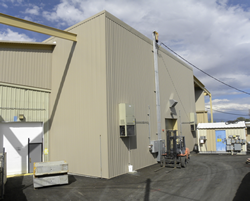 The building is approximately 4000 ft2 with a 5-ton crane capacity and houses two flight paths: 15-degrees right (15R) and 15-degrees left (15L). The 15L flight path is designed for the Chi Nu experiment and contains a 6m x 6m and 2m deep pit to reduce the background from scattered neutrons. The goal of the Chi Nu experiment is to measure the neutron output spectrum from fission especially below 0.5 MeV and above 5 MeV where the existing data is sparse. [250WNRnewbldg.png]The building and the installation of the 15L flight path for Chi Nu opens up the 30-degree right flight path for semiconductor testing by industry and universities. Because the neutron spectrum at 30-degrees at WNR Target-4 mimics the cosmic-ray induced spectrum, there has been high demand for such a flight path to increase our capacity beyond what is presently available in the ICE House (30L). With the new 30-degree flight path we have doubled our capacity to accommodate industrial users for testing of  semiconductor devices. The GEANIE (60R), ICE-II (30R) Chi Nu (15L),  ICE House(30L) and the TPC (90L) will be ready for beam when the run cycle starts in mid-August.